I presented on the first day of the 2018 SRHE Conference in Newport, Wales. The Society for Research in Higher Education (SRHE) met last week for its 2018 conference. On Day 1, I delivered a summary report on national education policies in relation to what female engineering students told me about school experiences that led them to study engineering. SRHE is a UK-based organization and its annual meeting is held each December in Wales at the Celtic Manor near Newport, a high-end golf resort where the organization has garnered good deals by assembling mid-week, off-season. The place was decorated beautifully for Christmas and I got a room on the tenth/top floor, with views of the nearby hills. Because I’m a genuine geek, I attended seminars straight through and missed out on the facility’s lovely pool, ice skating rink, and challenge course. Despite missing those thrills, I found the seminars delightful. In this blog, I can’t describe all the fascinating things I learned at the conference, but I’ll share some overarching thoughts and impressions. View from my tenth-floor room of Celtic Manor. The opening and closing keynote speeches were very interesting, and they bookended the conference by taking opposite approaches to study international trends in higher education. Prof. Marek Kwiek delivered the opening keynote. He described how his mixed-methods research study was conducted. He collected over 17k surveys and 500 interviews across 11 European countries, and he identified eye-popping results that did not sit well with some conference attendees. Essentially, top earners in higher education in Europe are more research-oriented, they publish much more than other academics but they also work quite hard, spending more time than others on *all* aspects of academic work–including teaching, research, service, and administration. This goes against commonly held beliefs, and prior research, that suggests researchers successfully avoid work other than research. Prof. Kwiek said the top 10% of researchers produce 50% of all journal articles. Prof. Kwiek found that the top 10% of researchers produce 50% of all journal articles. Top-producers work a full two months per year more than most university teachers. They also collaborate with many others internationally when they publish. But what visibly agitated the audience was the demographics Prof. Kwiek identified with regard to these top performers: they are predominantly male, middle-aged, full professors, with a mean age of 47. Being that I’m 48, I am already behind–but more than willing to catch up! I’m a quick learner, and now I have the code for success. In this case, Prof. Kwiek highlighted an inherent problem: that the variables that mean the most to promotions/progression, salary, and prestige consistently favor men. This is not a problem of Prof. Kwiek’s making, but it is a situation his data clearly showed. Meeting with my phenomenography mentor, Dr. Mike Miminiris and his US-based friend Marquis Moore. The other bookend presentation, the closing keynote by Prof. Louise Morley of the Centre for Higher Education and Equity Research in Sussex, would highlight several relevant and important points in response. One interesting point Prof. Morley raised was that the person who identifies a problem often comes to be seen *as* the problem. Another interesting topic she raised was that bias built into the system of higher education ties to our overall economic-political model called “neo-liberalism” and this makes it nearly impossible to escape. It’s like trying to avoid air. How can we step outside this model to properly credit diverse contributions, when all the measures of performance inherently favor mainstream versions of excellence and productivity? An extremely informative panel with Profs. Ellen Hazelkorn and Vikki Boliver and Kalwant Bhopal. Although I am not a positivist (similar to Prof. Kwiek), I also haven’t adopted the critical perspectives that Prof. Morley uses. I haven’t entirely rejected the neo-liberal framework, and most of my research takes an interpretivist and/or constructivist stance in that I study the status quo prior to suggesting ways to change it. I do incorporate some aspects of critical feminism and critical race theory, but these are underlying principles, not the core paradigm I use. With regard to neo-liberalism, back during my Ph.D. studies, I really enjoyed the class I had at William and Mary called “Finance of Higher Education.” My teacher, Prof. David Leslie, studied economic trends in USA higher ed and he identified patterns like this. He exampled that in the States, there’s a direct correlation between the discipline you teach in, the pay you’ll receive teaching in that discipline, and how traditionally male- or female-dominated the profession is. This means that in the USA, I can get paid more by teaching in an architecture or engineering department than in an education department. I did look this up and found it shockingly true. Dr. Maryam Al-Mohammad presenting on “global citizenship” alongside Dr. Neil Harrison, both from UWE. Fortunately, in European higher ed, the pay grades are less inherently tied to gender. On the whole, there seems to be better pay equity among disciplines in the European academy. Despite the fact that there is more equitable pay for equal work, men still reach the top echelons of higher education management/administration (and research) at much, much higher rates than women. Ireland, for example, is far behind the US where many university and community college (the US equivalent of the Irish IoT) presidents are female. So, yes, bias regarding gender, ethnicity, physical ability, etc., etc., etc. is still extremely pervasive. Understanding bias, and visualizing why and how it happens, can help us remedy the problems. So, even though the findings Prof. Kwiek presented were gloomy overall, he did provide me with helpful ideas for accelerating my career. I’ve been trying to break into publishing in a new discipline (I’ve moved from publishing in architecture education and education planning journals to publishing in engineering education) and the findings Prof. Kwiek reported will help me set, and meet, my goals faster. For me, having a road map of what it takes to succeed under current conditions is an important step in moving ahead and I thank Prof. Kwiek for providing such a guidebook. A later speaker during Day 1 of the conference, Dr. Rachel Handford, noted that “possible selves” “can only include those selves that it is possible to perceive (Stevenson & Clegg, 2011; 233)” meaning that we learn what we might become and consider options before we act, but we need to see examples of possibilities first. I’ve always found this to be true, and I try to expose myself to many different people with different ways of working and seeing the world. They help me figure out what I want to be, learn, do and accomplish. There are photos of Dr. Handford’s presentation below, as well as presentations by Prof. Ming Cheng (on Chinese students studying abroad) and Drs. Cecelia Whitechurch and William Locke (on academic staff members’ techniques for gaining promotion). I need to wrap up, though I would like to mention other highly-notable moments: three presentations on higher ed in South Africa, one presentation on low-income UK students studying abroad at elite US institutions, a fascinating panel that included Profs. Ellen Hazelkorn and Vikki Boliver and Kalwant Bhopal, a presentation by Drs. Maryam Al-Mohammad and Neil Harrison on “global citizenship”, and talks by historians Prof. John Tyler and Dr. Mike Klasser. Prof. John Tyler delivered a keynote on the impact of WWI on higher education in Europe and his presentation was insightful. In the US, the aftermath of the Civil War and WWII were turning points for higher education. I’d say the Morrill and Hatch Acts which established the Land Grant institutions in the US mark the birth of the modern university in North America. These facilitated providing higher education to the masses. The federal government became involved in funding higher education. These funds expanded after WWII when our country needed to re-train returning vets and decided to provide money to send them to university. The US government also decided to fund research via universities, as it had worked well for the US to have Harvard run the top-secret Manhattan Project that developed the A-bomb and helped end the war. These are all things I learned in the “History of Higher Education” course I took at Old Dominion University in 2009. At SRHE, Prof. Tyler explained that the dawn of the modern university in the UK came after WWI. In a paper presentation, Dr. Mike Klassen discussed his research on “the academization of engineering education in the United States and the United Kingdom: A neo-institutional perspective.” Dr. Klassen recently visited UCL (for our recent CEE strategy meeting) but I hadn’t learned what he was studying other than higher ed policy. At SRHE, I got to hear him present on the history of engineering education. I’m hoping that someday he’ll want to study overlaps between engineering and architecture education history and pedagogy development–again comparing North American and European traditions–and that the two of us can work together on this. I left SRHE having forged many new contacts. I met so many people I’d like to keep in contact with and learned so many new ideas and research findings. I look forward to attending SRHE 2019 and speaking at an SRHE workshop, to be organized by Ann-Marie Bathmaker, in spring 2019. The Engineering Education Research Network (EERN) for the UK and Ireland met today at Newcastle University. Since one third of the presentations at this colloquium were delivered by DIT’s research group called CREATE (for Contributions to Research in Engineeing and Applied Technology Education), I got to catch up with my beloved colleagues from Dublin. Yesterday, Emma Whitney, a colleague at UCL asked me to Tweet the events since three of us from UCL were attending. She gave me a few pointers for Tweeting, and I gave it a go. @shannonchance7 has never had much success with Twitter. But with Emma’s tips I was able to do a respectable job (although I can’t get Twitter working now, on the train back to London, so perhaps I downed the platform!?). It was great hearing about the #engineeringeducation #educationresearch folks are doing across Ireland and the UK. This was the first EERN event with specific discussions to help support and guide PhD students and early-career/newer researchers. I actually feel that we’re all new to this! It’s an emerging field of research and were working hard to establish the methods, publications, conferences, and knowledge-sharing networks. I’m delighted to be part of such a vibrant community, dedicated to improving the student experience and the quality of learning. I’ve uploaded photos of the conference and also of my morning exploration in Newcastle-upon-Tyne. It’s a lovely little city and I’ll hope to return again some day. I’m celebrating the publication of a new journal article today, with the help of Sally O’Neill. She’s one of the librarians here at DIT, and she secured permission and posted the article on DIT’s website, making it free for you and anyone else to download. The publishing process is glacially slow. I submitted the paper in March 2014, based on a conference paper delivered in 2013. And here I am, in February 2016, with the final publication finally in hand. Many time, in research, it takes time to see the results of your work. Seeing this in print helps make all these days, sitting at a computer analyzing text, feel more worthwhile. Once I can see that people are downloading it, and once I start getting feedback and citations in other people’s research papers, I’ll celebrate some more. I know what I’ve learned through this research is useful, because I get to apply it in the classroom and in the design studio. The rewards of printed research are more slow to crystallize but also extremely important, especially for people who want to gain credibility in research and build a career around research. This new article, written with the help of John Marshall in Michigan and Gavin Duffy here in Dublin, is about Using Architecture Design Studio Pedagogies to Enhance Engineering Education. Simply put, we believe that design education and hands-on forms of learning can help improve the quality and experience of learning in engineering and other STEM disciplines. The results reported in this paper provide support for that claim. Above are pictures from design studios in Lisbon at IST and one for a study abroad program offered by Hampton University. Very, very hands-on! Michael inserting the thermal sensor into one team’s cube. One of the cubes heating up (powered by an incandescent lightbulb). Finishing up the lighting test. These are photos from electrical and mechanical engineering projects I’ve helped conduct at Dublin Institute of Technology. For this new paper, I created a matrix to describe design behaviors in relationship to epistemological development (which has to do with how we view knowledge). I compared what the students wrote in their blogs to the definitions in my chart. Doing this, I was able to identify development of design skills as a result of students working in groups, and I even pinpointed some instances of epistemological development. John and Gavin helped check the work so that it would be more credible and reliable. They offered perspectives of insiders in the studio (John) and outsiders interested in group-based learning, Problem Based Leaning (PBL), engineering education, and epistemological development (Gavin). This article should be of interest to any teacher who wants to help students develop new design, design thinking, or epistemological skills. Please feel free to read it and email me any questions you have, at irelandbychance [at] gmail [dot] com. Chance, S., Marshall, J. and Duffy, G. (2016) Using Architecture Design Studio Pedagogies to Enhance Engineering Education. International Journal of Engineering Education Vol. 32, No. 1(B), pp. 364–383, 2016. I just made my annual appearance at the class on theories about college students’ development taught by Dr. Jim Barber. Last year I got to be there in person, but this year it was back to Skype. Fortunately, the new version of Skype allows for screen sharing. 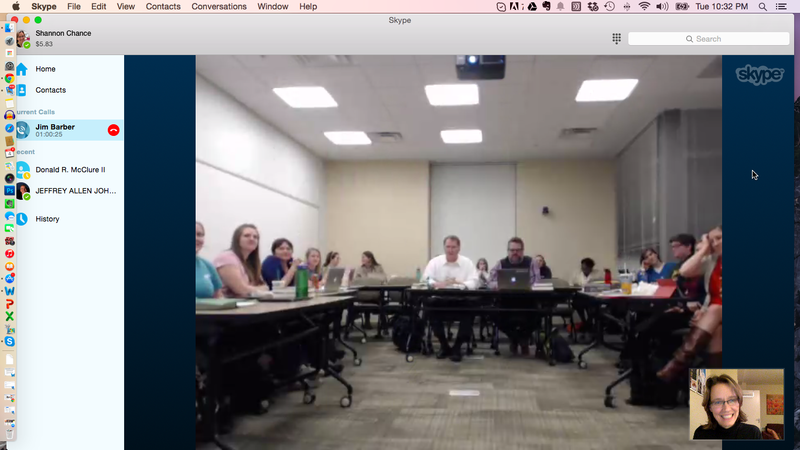 It is always a bit disorienting for me to deliver guest lectures online, but I don’t think it was too painful for the audience tonight — on account of this new technology. Today at DIT, my research project is fully underway, and every day I’m drawing from the theories I learned in this very informative class that I had the good fortune to take, way back in 2006, at The College of William and Mary. Tonight, I discussed two research methods I’ve been using — the first using template analysis and the second using descriptive phenomenology. If you’d like to view the Prezi I presented, you can click here. The best part of the evening was that the William and Mary grad students — 22 in all — had lots and lots of questions. I couldn’t gauge exactly how well I was connecting with the folks in the back row (who contributed lots of great questions) because the resolution was only so/so, but I have been loving that the fact that my Skype/Messenger/iMessage/MagicJack technology has been improving every day! It’s five hours later in Dublin than back in Virginia, so the evening is quite well worn here. And since I’ve got a researcher “media training” workshop in the morning, I’d better hit the sack now…. Adieu, Adieu, To you and you and yo-u! 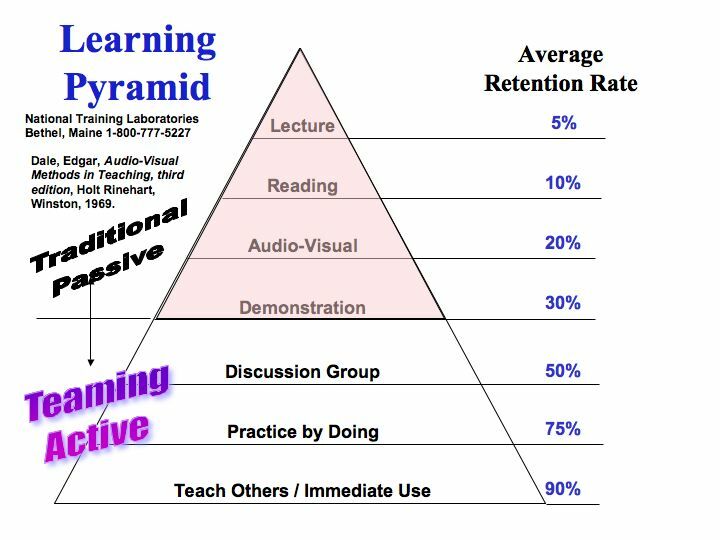 Why Get Students to Teach? 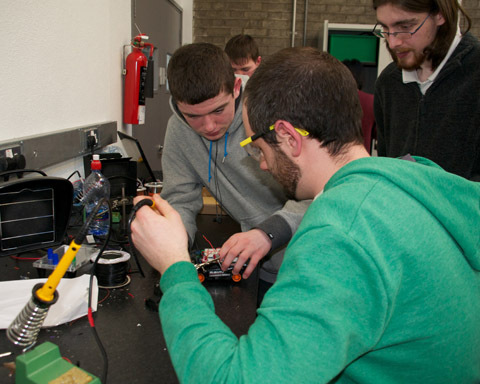 DIT students preparing for a Robo Sumo time challenge. This interesting information came from Inform magazine. A publication of the Institute for Applied Behavioral Science was cited as the source. I searched out this image after Ted posted the comments below. The chart was derived from research by Dale (1969) and is available on a web page of the University of Sydney. Today’s an interesting and fairly typical day… morning yoga, transcribing, fairly successful bike ride/commute, book discussion with Gavin, lunch meeting with engineering lecturers, introductions with administrative leaders in engineering. We are preparing for a seminar that all of us will present to the College faculty in a couple of weeks. Evidentially, some things Gavin and I discussed with the Dean (while we were in Greece) interested him enough to prompt a seminar. Later today, I’ll head to an event on “stories” at Notre Dame’s O’Connell House. For now, reading in the office. Here’s a photo of some of the engineers I met with (Dave, Ted, and Gavin). We took lunch in the staff cafeteria in the top floor of “Kevin Street” (i.e., the DIT building located on Kevin Street).